It’s raining heavily for the last 2 and a half days. But yesterday morning the situation was a bit different. Around 7 a.m. the sky was somewhat clear and once again the sun was out. The sunshine had the feel of Durga Puja written all over it. I know this sunshine since childhood and I think every Bengali do the same. Anyways seeing the clear sky, a plan came to my mind. 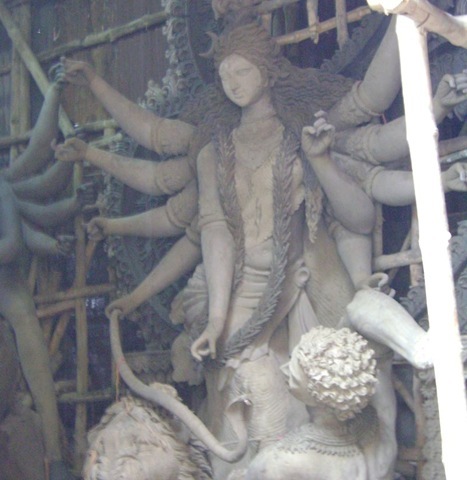 I decided to go to Kumartuli (it’s the seat of the clay artists in Calcutta) to take some snaps. I phoned Pravat to tell him about the plan. Luckily he was awake (Pravater pravat khub derite hoi kina!) and he at once agreed. So we contacted the Clay Artists’ Samity and bought a season pass so that we can have the permission for the rest of the season. But as I said earlier luck was on the other side. The clay artists have already started covering the idols to protect them from the rain. Somehow we managed to take some snaps. I told Pravat that there is a ghat nearby. 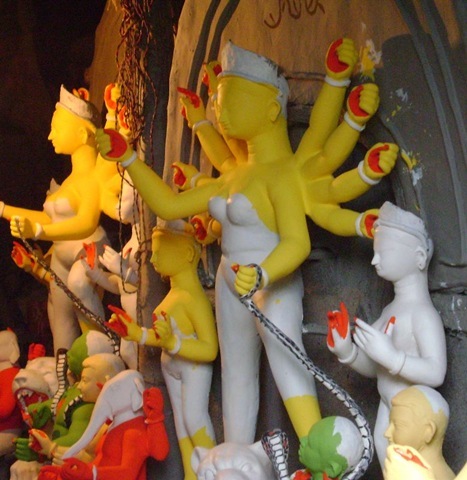 It is called Kumartuli Ghat (I have Googled the area in the morning). He was very eager to go there. So taking help from the locales we went there. The riverside view was really beautiful. Frankly speaking on seeing the raindrops falling in the river my heart suddenly became more enthusiastic. I could see the joy in Pravat’s eyes. I took some pictures of him. He was really happy and enjoying getting drenched in the rain. There we took few more pictures. By the time we finished taking pictures at the riverside I was completely drenched. I told Pravat why not return to Kumartuli again to take some pictures. Then we had a plan. 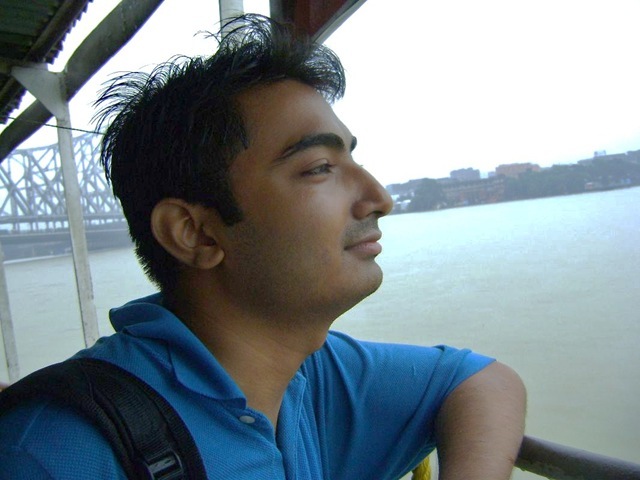 We decided to take some pictures at Kumartuli and to return to Kumartuli Ghat again. From there we decided to go to Babughat from where we can return home. 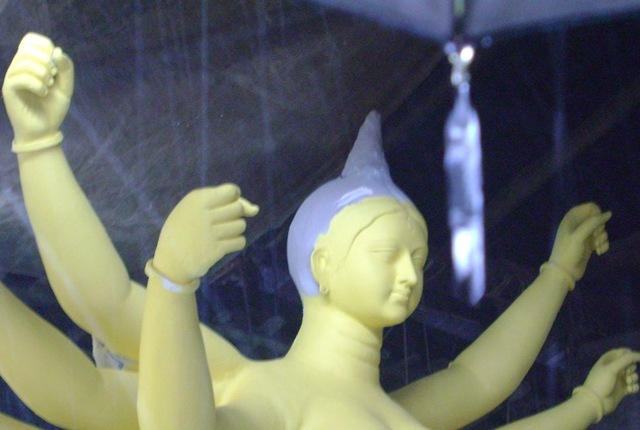 So we returned to Kumartuli where I found this idol. Though it’s in its formative stage yet its beauty really attracted my eyes. The artisans are really magicians. But it’s really sad they don’t receive the accolades they deserve. Anyways we weren’t been able to take any more idol pictures. So we decided to come back after the sky changes its plan within few days. May be on the Mahalaya . As per our plan we returned to Kumartuli Ghat and from Baghbajar Ghat we boarded a launch (marine vessel). I haven’t rode a launch on a rainy day like this. So I was excited to enjoy the river from the launch. But unfortunately my excitement decreased a bit immediately. I took out my specs from the pocket and as I was about to wipe its glasses I found it broken. Really a shock!! I smiled and began taking pictures again. Each one of us gave different poses to the other to capture. Really we were enjoying very much. Then we had Masala Badam and Cha. Really the day was a reminiscent of the school days as a child when we used to enjoy Rainy days like this. really awesome…. wish I was also a part of it!!! Sometimes little madness r pretty good…hee…hee..
those who r willing 2 go next time plz do 4ward ur applications 2 pravat 😉 … we will b going soon again!!! after going through your blog,the only thing that came in my mind is,”ishh ami jodi jete partam…”. 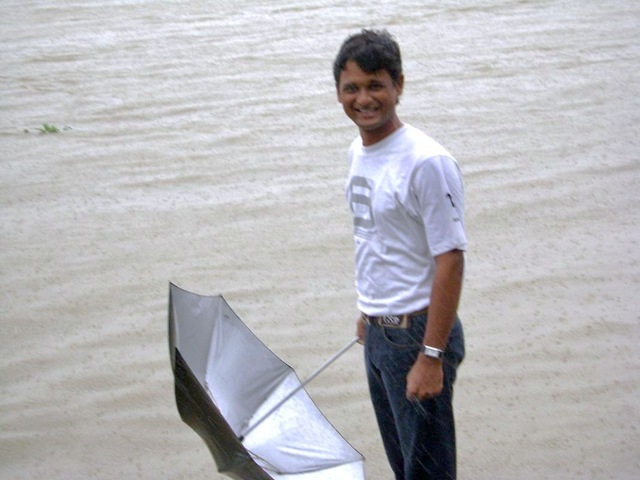 oh yes i loved the concept of letting the umbrella down once and feeling it rain over me…just awesome.